Sponsoring Organizations: Maryland Native Plant Society, Virginia Native Plant Society's Potowmack Chapter, and the Arlington Regional Master Naturalists. PDF file with directions and description. Directions: Exit from the Capital Beltway (495) onto River Road heading west towards the village of Potomac (junction of Falls Road and River Road). Continue on River Road westward past this intersection app. 1.7 miles to Piney Meetinghouse Road. Turn right onto Piney Meetinghouse Road and proceed gradually uphill for app. 2 miles. Turn left onto Palatine Drive and proceed for about 1 mile to intersection with Greenbriar Road. Take a right onto Greenbriar Road and proceed app. 1/2 mile to Centurion Way. Take a right onto Centurion Way and proceed app. 1/3 mile - and when you start seeing the high-wire powerlines, please begin parking along right side of street first, as space allows. Centurion Way is only about 1/2 mile long and ends as a cul-de-sac, so we'll have to park along both sides of the street. This is a residential neighborhood, so please make sure not to block driveways or easy street access and to take care not to leave ruts or tire tracks in grass along road shoulder. When right side fills up, please circle around and park on left side of road. After parking, walk to edge of powerline where we'll meet. * As you're heading uphill on Piney Meetinghouse Road, look for signs of how the landscape (geology, soils, and vegetation) changes as the road nears the high ridge of the serpentine barrens. The Mesic Mixed Hardwood Forest below gradually changes to a much more open woodland of oaks and pines - hence the name Piney Meetinghouse! - and abundant outcrops of serpentinite. As you head closer to the meeting location - through a rather ghastly display of McMansion vulgarity and ongoing land desecration - take note of the abundance of Shortleaf Pine (Pinus echinata), probably the region's single largest occurrence. Wear sturdy shoes and bring lunch or snacks and water. Most of the walk traverses fairly open woodland, open glades, and grassy areas over gently rolling uplands, though some trails may be gravelly to moderately rocky. We'll probably walk maybe 2 to 3 miles maximum throughout round trip - and the way back to the cars will be pretty clear for those who want to duck out early. Online Registration (optional) Closes December 15. 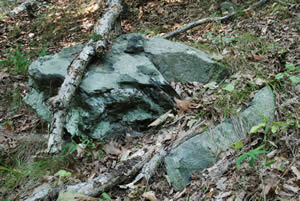 The Travilah Serpentine Barrens is the mid-Atlantic region's stellar example of a globally-rare forested serpentinite community. 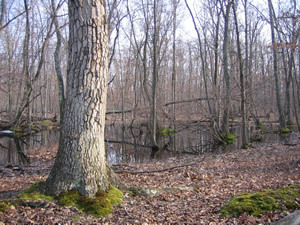 This vegetation type once comprised many thousands of acres in the area of Montgomery County west of Potomac and Rockville, with about 1,000 acres of this rare local landscape preserved today. Serpentinite is an ultramafic rock derived from magnesium-rich silicate materials that typically weathers to a soil that is high in magnesium and iron. The Travilah serpentinite is dark grayish green and closely underlies the surface, frequently outcropping throughout. Soils of this type are fairly nutrient deficient and produce a somewhat stunted vegetation characterized mainly by oaks, hickories, pines, and heaths, though plants of the Rosaceae, Cyperaceae, Poaceae, and Lamiaceae, among others, are also prominent. Serpentinite outcrop at Travilah Barrens. Photo by R.H. Simmons. Much of the forest at the Travilah site is old-growth, despite the relatively short height of the canopy trees. The canopy is predominately white, northern red, and post oak; sweet pignut, mockernut, and pignut hickory; and shortleaf and Virginia pine. Prominent understory plants are eastern red cedar, blackjack oak, sweet crabapple (Malus coronaria), a variety of hawthornes (Crataegus spp. ), black haw, dogwood, fringe tree, and others. Some sections of the forest floor are densely vegetated with colonies of ericaceous plants of the Heath Family, such as deerberry, lowbush blueberry, and black huckleberry. Other are extensive glades of graminoids (grasses and grasslike plants) and wildflowers, many of which are regionally rare. We'll also see many grasses and plants typical of meadows and prairies and a rare Upland Depression Swamp. Ancient black gum at edge of Upland Depression Swamp at Travilah Barrens. Photo by R.H. Simmons.